Helping my customers get the right systems for their needs since 1999! BEST DEAL FOR YOUR ORGANIZATION! Post to backboard extension distance is 72"
When it comes to the playground, no other basketball system can stand up to the TYRANT! First Team�s Tyrant basketball system is our largest, most rigid basketball system yet! 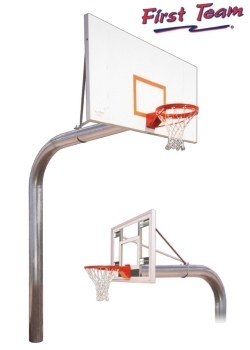 With it�s incredible 6 5/8� diameter galvanized post and outstanding 72� overhang, the Tyrant stands alone as the country�s leading playground basketball system. First Team has incorporated its easy to install nosecone into the Tyrant pole structure design. This makes installing the backboard much easier, minimizing backboard lifting when installing the backboard. The Tyrant is INDESTRUCTIBLE and First Team backs it with our SUPERIOR LIFETIME WARRANTY! For added safety, pole padding and backboard padding are available for any Tyrant basketball package. So why let your basketball court be run down by other systems that can�t hold up? Let First Team show you the true meaning of reliability and toughness with the TYRANT! Includes all mounting hardware and installation instructions. (LS) Call or submit this form for IMMEDIATE pricing. Restrictions prohibit us from showing our low price. Fill out and submit this form to receive IMMEDIATE initial pricing. Additional discounts on unit price and/or freight apply for multi-unit purchases. I will follow up with more information based on your specific interest and ship to zip code. MAKE SURE TO INCLUDE YOUR EMAIL ADDRESS or PHONE. Covers any damage caused by normal basketball activity and normal player contact with the goal. "Normal basketball activity" and "Normal player contact" shall be described as any action that is necessary for participation in the game of basketball. Deliberate hanging on the rim, multiple player hanging, and vandalism are not covered under the Limited Warranty. Same as above for a period of 20 years. Covers any damage or failure caused by any type of basketball activity or related contact with the unit. This includes deliberate hanging on the rim as well as multiple player hanging. The Superior Warranty does not cover vandalism. Covers any damage or failure that occurs for any reason. Any product carrying an Unconditional Warranty is exempt from the previously stated limitations. Note: Any normal wear and tear caused by weathering or UV exposure is not covered under any First Team warranty. All painted items carry a one year limited warranty on coating. Durable, dependable basketball systems affordably priced and designed for slightly lighter use than public, unsupervised play. Recommended for private family, supervised use. The majority of the deals I put together for my customers are for multi-unit purchases. Given that, I can negotiate better shipping rates from the various freight carriers, Yellow, FedEx, SAIA. Private consumer orders and single-unit orders are welcome and encouraged! You'll get the same great unit price and the lowest possible cost on freight. DON'T BE FOOLED by system pricing that includes FREE freight. I can beat those prices. Hands down the RuffNeck System; in-ground, fixed-height, is the most cost-effective for public, outdoor use. 20-year warranty, nice board size, very cost-effective. RuffNeck systems ship for as little as $110 depending on location. RuffNeck systems ship for as little as $110 depending on location. For a little nicer looking system with a bit more functionality, consider the Legend and the Legend Jr.
Adjustable Height: You can't go wrong with any. Most cost-effective is the Attack System but the move up to the Force System or Titan System gets you not only larger board size options, but also the Lifetime Superior Warranty. Portables: The Fury System is the most commonly sold system to church groups and youth groups, and any organization type where you know, more or less, who's going to play on it. It's heavy enough for aggressive adult play and more than stable enough for youth play. Lifetime Limited Warranty covers everything basketball related, including dunking, but not the SHAQ hang on the rim gorilla slam. For aggressive play or high-level competition play, go up to the Storm System or Thunder System. They are heavier so can support a larger board (glass) and they come with a Lifetime Superior Warranty. Everything is covered. Please contact me via this web site or give a call toll free if I can answer any questions. I assure you I can put you in the best system for your needs and no one will be more helpful as you sort through sourcing your systems.